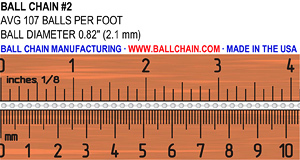 Slightly larger than the #1 chain, the #2 or 2.1 mm diameter size is used for fine jewelry such as necklaces and bracelets, and can also be used for (advertising items), key chains, neck chains, etc. .082" 2.1 mm 107 8 lbs. 16 lbs. CHECK 16 lbs.